CULTIVATE, directed by acclaimed composer-clarinetist Derek Bermel, is an annual, intensive creative workshop and mentoring program for gifted American composers in the initial stages of their professional careers. 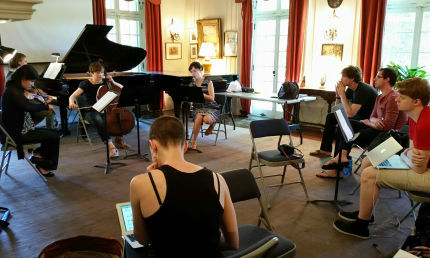 Each year, six young composers will be awarded Fellowships to participate in this weeklong emerging composers institute, which takes place at Aaron Copland’s National Historic Landmark home in Cortlandt Manor, one hour north of New York City, and at the historic Merestead estate in nearby Mount Kisco. 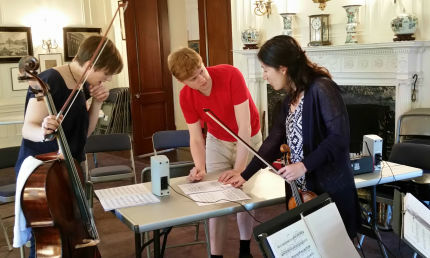 Combining the most valuable elements of apprentice workshops and musical reading sessions, CULTIVATE nurtures young composers in realizing their creative ambitions as they begin their professional careers. The institute offers Fellows intensive compositional guidance in a rigorous, collegial, and nurturing environment before, during, and after the institute. Fellowships cover all costs for session participation and events, round-trip transportation within the continental U.S., accommodations, and food. John Corigliano (far left) meeting with 2016 CULTIVATE Fellows and Derek Bermel at Lincoln Center during a visit to the New York Philharmonic Biennial. 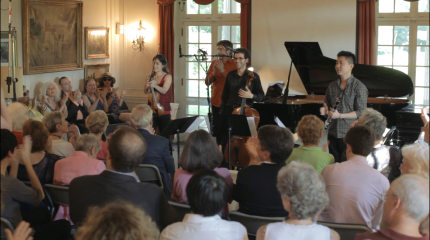 Each Fellow composes one 5- to 7-minute, small-ensemble composition (any combination of clarinet, violin, cello, and/or piano), which serves as the core of his/her work at CULTIVATE. The schedule consists of daily individual and collective work sessions or rehearsals with composer and program director Derek Bermel and with the Music from Copland House ensemble on the Fellows’ new works for CULTIVATE; informal discussion sessions about practical, professional, and career matters with prominent music executives and arts leaders (past guests have included James Kendrick, Limor Tomer, Greg Sandow, Alan Pierson, Richard Kessler, and Elizabeth Dworkin); and a final public concert and live recording premiering the Fellows’ new compositions. Open to emerging professional composers who are American citizens or permanent residents, writing in any genre. While there is no specific age limit, CULTIVATE is geared towards composers who are in their mid- to late-20s and in the earliest phase of their professional careers. Applications for CULTIVATE must be postmarked by December 1. Composers must submit a CULTIVATE application form (downloadable), three representative works and recordings, and 1- to 2-page resume. Fellows are chosen by CULTIVATE Director Derek Bermel and an annually-rotating jury of eminent, independent composers and performers. Proof of citizenship or resident status (birth certificate, U.S. passport, Board of Elections registration card, or INS document, NOT driver's license or Social Security card). Brief (1- or 2-page) resume. Three scores that best represent your work (smaller printed formats—e.g. 8 ½” x 11”—are strongly encouraged). Submit recordings of these three works. If any are unavailable, recordings of other works should be substituted. CDs are the only acceptable format. MIDI recordings are acceptable but not encouraged; MP3 or other electronic files will not be accepted. The disc and the CD case must BOTH be clearly and identically labeled with your name and work title, and, if applicable, track and movement/section list. Awards are made possible by contributions from donors like you.